How is an Iowa Workers' Compensation claim dispute handled? How is an Iowa Workers' Comp claim dispute handled? A dispute of your Iowa Workers' Comp claim is handled by 3 main parties: yourself, your employer or their insurer, and the Workers' Compensation Commissioner (WCC). The WCC is a neutral party, and your employer or the insurer probably has their own legal backing, so it's in your best interest to have a work injury attorney from Des Moines, Iowa on your side. Disputes of an Iowa Workers' Comp claim can happen for any number of reasons at any stage of your claim resolution. Sometimes it starts with your employer neglecting to file a report with the Iowa Division of Workers' Compensation. Other times it may be the insurance company refusing to pay you disability benefits. No matter what the dispute, it can be handled by the office of the WCC, which is responsible for upholding Iowa Workers' Compensation laws. Considering the WCC is impartial and only serves as a resource for the rights of the parties and procedures to resolving disputes, you should find legal guidance from a work injury attorney. Des Moines, Iowa is home to thousands of workers and they all have the same basic rights under Iowa Workers' Compensation law. To protect your rights when you find it necessary to file an Iowa Workers' Comp claim, you should have an attorney on your side who knows the laws and how to handle a dispute should one impair your claim. With so much at stake in your Workers' Comp claim, and so many factors that could potentially ruin your case, you should establish a relationship with your attorney as soon as possible. Before disputing an Iowa Workers' Comp claim you should seek professional help to make sure you aren't ruining your chances at a fair settlement. An attorney at Walker, Billingsley & Bair will know the importance of protecting your claim from the get-go. 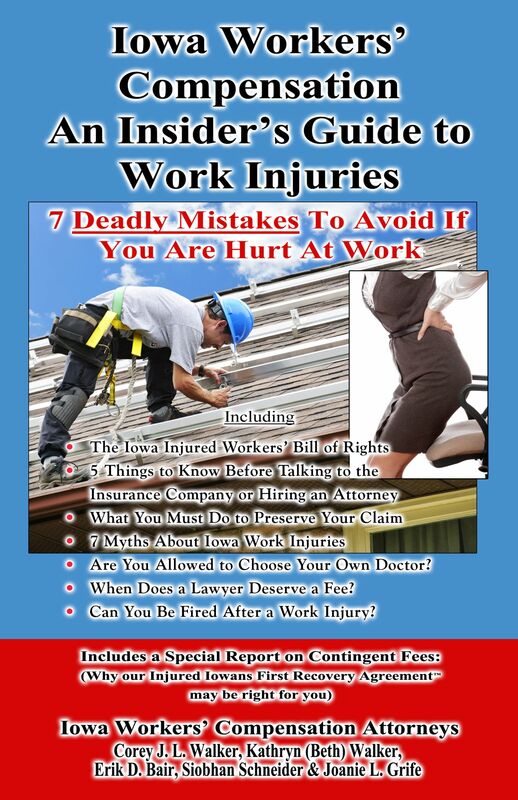 Learn more by ordering this FREE book; Iowa Workers' Compensation - An Insider's Guide to Work Injuries: 7 Deadly Mistakes To Avoid If You Are Hurt At Work by calling 1-800-707-2552. For immediate assistance or to schedule a consultation, call (888) 435-9886.